Take Current Affairs quiz March 7, 2019 to enhance your General Awareness. Practice with our esteemed Current Affairs quiz March 7, 2019 questions which covers all important events across India as well as World. Make use of all important Current Affairs quiz March 7, 2019 questions with answers updated here, at free of cost to succeed in all competitive Exams and Interviews. Odisha state Government announces financial assistance for craftsmen. Which of the following auto company partnered with the Japan space agency to develop a lunar rover? Toyota to join hands with Japan Aerospace Exploration Agency (JAXA), Japan’s space agency, on a planned mission to the moon, with the Japanese auto giant expected to develop a lunar rover. Who has been nominated as the Director-General of Food and Agricultural Organisation (FAO)? India has nominated Ramesh Chandra, a member of Niti Ayog, to head Food and Agricultural Organisation (FAO). Government of India, the State Government of Chhattisgarh and the World Bank signed a _______ Loan Agreement to support the State's Reforms. The Government of India, the State Government of Chhattisgarh and the World Bank signed a $25.2 Million Loan Agreement to support the State's Reforms in Expenditure Management under Chhattisgarh Public Financial Management and Accountability Program. With which Country did India sign to set up a joint maritime surveillance system in the country? National space agency ISRO and French space agency CNES signed an agreement to set up a joint maritime surveillance system in the country in May. Which Country was reffered as a Key Hub for Illicit Drug Trade by United Nations Office of Drugs and Crime (UNODC)? United Nations Office of Drugs and Crime (UNODC) has referred to India as a Key Hub for Illicit Drug Trade. Malaysia will officially be the _______ member of the International Criminal Court (ICC) on June 1, 2019. Malaysia has ratified the Rome Statute to the International Criminal Court (ICC). Malaysia will officially be the 124th member of the court on June 1, 2019. Which of the following Country recently joined the International Criminal Court? Malaysia has ratified the Rome Statute to the International Criminal Court (ICC). The UN released a depositary notification indicating Malaysia’s accession to the ICC. Which company has recently set up its first solar-based electric vehicle (EV) charger on the Delhi-Chandigarh Highway? Bharat Heavy Electricals Limited (BHEL) has set up its first solar-based electric vehicle (EV) charger on the Delhi-Chandigarh Highway. Who has been appointed as the Director of BARC (Bhabha Atomic Research Centre)? The Bhabha Atomic Research Centre (BARC) has appointed scientist Ajit Kumar Mohanty as its Director. Bharat Electronics launches SWAGAT- Automatic Fare Collection Gating System. Three districts of which Indian state have topped in the Niti Aayog development ranking of aspirational districts for the December 2018-January 2019? Three Jharkhand districts Chatra, Sahibganj and Hazaribagh have topped in the ranking of aspirational districts by Niti Aayog for the December 2018-January 2019 period. Historic Guinness World Record in yoga in Hong Kong made by over 1000 people. India’s Unemployment rate rose to ______% in February 2019, the highest since September 2016. According to the Centre for Monitoring Indian Economy (CMIE), the unemployment rate rose to 7.2% in February 2019, the worst in 28 months, and up from 5.9% in February 2018.
Who has overtaken Warren Buffett as the world's third-richest person, on the Bloomberg Billionaires Index? On the Bloomberg Billionaires Index, French luxury goods tycoon Bernard Arnault has overtaken Berkshire Hathaway Chairman Warren Buffett as the world's third-richest person. 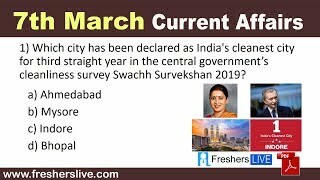 Which city has been declared as India's cleanest city for third straight year in the central government’s cleanliness survey Swachh Survekshan 2019? Indore was adjudged India's cleanest city for the third straight year in the central government's Swachh Survekshan 2019 awards. The second and third positions were grabbed by Ambikapur in Chhattisgarh and Mysuru in Karnataka, respectively. Are you looking for right place to enhance your Knowledge on Current Affairs of 7th March 2019 through effective Quiz section? FreshersLive grants you the advantageous Current Affairs Quiz questions with accurate answers for 7th March 2019 which covers all the important events, supreme Awards, major occurrences in the National as well as World level. All important Current Affairs Quiz questions of 7th March 2019 are updated instantly in this page. Everyday at least 25+ Current Affairs Quiz Questions are displayed in this FreshersLive page. Correct Answer for each quiz question is given at the end of the entire 7th March 2019 Current Affairs Quiz questions section. You can estimate and upgrade your GK by attending these useful quiz questions. Entire quiz questions of 7th March 2019 Current Affairs covers Competitive Exam as well as Interview point of essentially important topics like International News, National News (ie. Indian Affairs), Science & Technology News, Environmental News, Bills & Acts Passed by Government, Defence News, About important Persons, Places, Banking & Economical News, Awards & Honours, Sports News, Revolutionary Updates on Arts & Culture, Obituary, Summits & Conference, Important Committee, Schemes, Appointments, Important Days & its Theme for Current as well as upcoming Year, Books & Its Authors, Agreements & MoUs, Budget, Taxes, Various Important Lists & Indexes, Visits by World Presidents, Prime Ministers, Political affairs and all Current Events. 7th March 2019 Current Affairs Quiz Questions updated in this page are prepared in the sense to help all aspirants to succeed in various Competitive Exams like UPSC IAS and other Civil Services Examination, Various Bank exams like IBPS PO, IBPS Clerk, SBI PO, SBI Clerk, RRB PO, RRB Assistant, Insurance exams like LIC AAO, UIIC Assistant, Railway Exams, Various Central Government Exams like SSC CGL, SSC CHSL, and more. Attempt all the Current Affairs Quiz Questions of 7th March 2019 and evaluate your score by matching your response with the correct answers mentioned at the end of this quiz questions section. By practising the FreshersLive Current Affairs Quiz Questions on a daily basis, you can surely succeed in the competitive exams as well as the interviews easily. Make use of this ultimate resource to the fullest and quickly achieve your goal!